Gov. 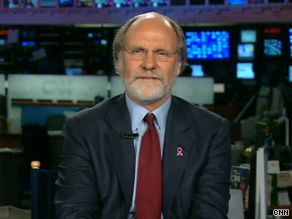 Corzine insisted Monday that a controversial ad was not about his Republican challenger's weight. WASHINGTON (CNN) - New Jersey Gov. Jon Corzine said Monday that a recent ad about his Republican challenger should have used a different expression than "threw his weight around," a turn-of-phrase which some political observers took as an effort to ridicule Chris Christie because of his waistline. Late last month, the Democratic governor released a campaign ad that focused on what the Corzine campaign views as Republican Christie's track record of using his status as a U.S. attorney to gain special treatment in New Jersey. But the ad measured accusations by "weight." "If you drove the wrong way down a one-way street, causing an accident and putting the victim in a trauma center...would you get away without a ticket?" the announcer said in the 30-second Corzine television ad. "Chris Christie did...."
"Christie threw his weight around as U.S. attorney and got off easy," the ad said. In a recent debate and last week on CNN's "Situation Room," Christie directly responded to the ad's implication about his size. "I'll let all of your audience in on a little secret," Christie told CNN's Wolf Blitzer last Wednesday, "I'm overweight and I've struggled with my weight for the last 30 years on and off and that's the way it is." Christie also told Blitzer that he thought the Corzine ad was "beneath the office [Corzine] holds," and the New Jersey Republican slammed his opponent for not admitting that the ad was targeted at his weight rather than his conduct. Appearing on "Situation Room" Monday, Corzine insisted that the controversial ad was meant to highlight Christie's behavior. 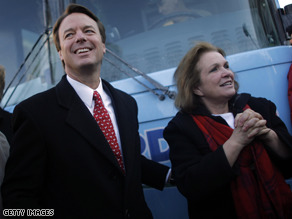 John and Elizabeth Edwards during the 2008 presidential campaign. (CNN) - Despite John Edwards' extramarital affair that rocked his marriage, his wife described their union as a "love story," albeit an unconventional one. Elizabeth Edwards told WJLA-TV in Washington late last week that she wants her marriage to work, and that her husband has been supportive as she continues to battle breast cancer. "John said, 'Perhaps not the great love story that we hoped, but maybe a great love story nonetheless," she said. Edwards added: "'Til death do you part, because that's what I want." Though Elizabeth promised to soldier on, she acknowledged the grim reality of trying to overcome terminal cancer. "Cancer will probably win," she said. "Why would I give it any more days than it may already take? That's the choice I make." WASHINGTON (CNN) - A new poll indicates that Republican Bob McDonnell holds a double-digit lead over Democrat Creigh Deeds in Virginia's gubernatorial battle. The release of the Washington Post poll Monday evening comes eight days before voters in Virginia head to the polls, and it comes on the eve of a campaign stop by President Barack Obama, who teams up with Deeds at a rally in Norfolk Tuesday. Fifty-five percent of likely Virginia voters questioned in the survey say they back McDonnell, the state's former attorney general, with 44 percent supporting Deeds, a state senator from the western part of the state. McDonnell's 11-point advantage is up from an 9-point margin last month. The poll indicates that McDonnell holds double-digit advantages on such issues at the economy, taxes, and transportation - and now leads Deeds for the first time in this campaign on issues of special concern to women. WASHINGTON(CNN)–In the latest installment of CNN=Politics Daily: As President Obama continues to face tough choices on troop levels in Afghanistan, US forces there experience the deadliest day in years. CNN's Pentagon Corrrespondent Chris Lawrence reports from the grounds of Kabul, Afghanistan. Meanwhile: The Pentagon rolls out the red carpet for one of China's most powerful military officers. CNN's Elaine Quijano takes a look at the big welcome just months after the two countries faced-off on the high seas. Finally: Senate Majority Leader Harry Reid publicly announced that he wants legislation to include a government-run health care option. CNN Senior Congressional Correspondent Dana Bash investigates a major turning point in the battle over health care reform. President Obama spoke at a fundraiser for the DNC in New York City last week. 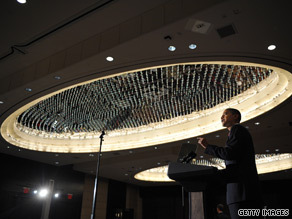 WASHINGTON (CNN) - President Barack Obama is the main attraction Monday night at a fundraiser in Miami for his party. A Democratic source tells CNN that the reception and dinner will bring in $1.5 million for the Democratic Senatorial Campaign Committee and its House counterpart, the Democratic Congressional Campaign Committee. A similar DSCC-DCCC joint event held in June in Washington and also headlined by Obama raked in nearly $3 million, according to party sources. Both the DSCC and DCCC out raised their Republican counterparts in September and both committees hold an edge over the Republicans when it comes to cash on hand. 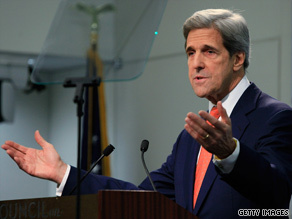 Sen. Kerry spoke about Afghanistan at the Council on Foreign Relations in Washington Monday. WASHINGTON (CNN) - The chairman of the Senate Foreign Relations Committee warned Monday against a narrowing of the U.S. mission in Afghanistan, but also suggested a plan by the commanding U.S. general in the country is overly ambitious. Massachusetts Sen. John Kerry said in a speech to the Council on Foreign Relations that a major U.S. troop pullout could trigger a civil war could between the Taliban and the Afghan government. It could also destabilize neighboring Pakistan, he added. Kerry's warning came in the midst of a comprehensive Obama administration review of U.S. strategy in the two countries. Kerry rejected the idea of a small-scale counter-terror campaign advocated by Vice President Joe Biden, saying it was no substitute for the wider ongoing military campaign. JACKSONVILLE, Florida (CNN) - President Barack Obama said Monday that the 14 Americans killed in two helicopter crashes in Afghanistan "were doing this nation proud." He said they "gave their lives ... to protect ours." Ten Americans were killed in one incident and four were killed in another, according to NATO's International Security Assistance Force. 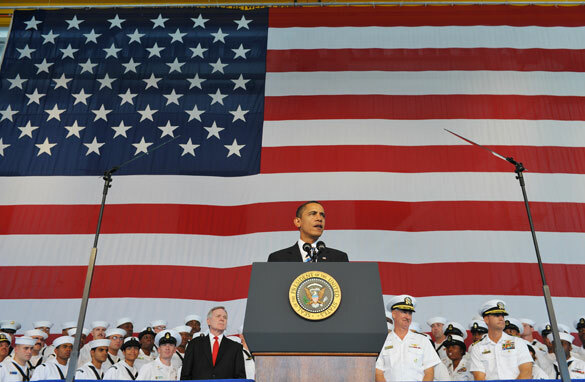 "Now, it is our duty, as a nation, to keep their memory alive in our hearts and to carry on their work, to take care of their families, to keep our country safe," Obama said, speaking at the Naval Air Station in Jacksonville. The Senate Majority Leader announced Monday that he intends to move forward with a health care bill that includes the 'opt out' version of the public health insurance option. 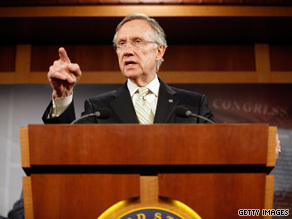 WASHINGTON (CNN) –Senate Majority Leader Harry Reid announced Monday that he intends to move forward with a health care bill including a public insurance option allowing states to opt out. House Speaker Nancy Pelosi has insisted the House of Representatives will pass a health care reform bill including a public option. President Barack Obama has indicated his preference for legislation including a public option, but has not indicated he would a veto a bill without one. Several top Democrats have previously expressed concern that the traditionally conservative Senate would not pass a bill with a public option. The public option is "not a silver bullet," but will ensure healthy competition and a more level playing field for consumers, Reid told reporters on Capitol Hill. 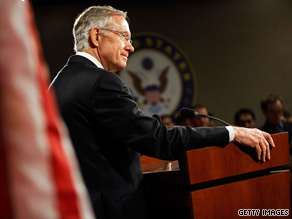 Public opinion polls show that a wide majority of Americans support a public option, he said.